So far the Best albums of the year have been Kendrick Lamar’s brilliant but heavy To Pimp a Butterfly and Sufjan Steven’s brilliant but heavy Carrie & Lowell. Despite their differences, both albums deserve your unbroken concentration to appreciate. These dsude mean serious business and, sure, they’ve never been better but it’s some seriously heavy content to casually jam in my car. Both albums feel like work; really emotionally satisfying and intellectually challenging work but I still feel like I need to clock out once they are finished. Carrie & Lowell just about brings me to tears every time I hear it and To Pimp A Butterfly is such a massive and heady undertaking that it sometimes takes me two days to get through the whole album. I have developed a profound appreciation and love for both of these albums over the past few months but if we are being honest, they are not very much fun. Her debut album Sometimes I Sit and Think and Sometimes I Just Sit, is a casual indie guitar rock album driven by a mundane stream of daily narratives infused with dead pan comedy. It’s charming in the quirkiest kind of way, generally sunny, occasionally gritty and I just love it. 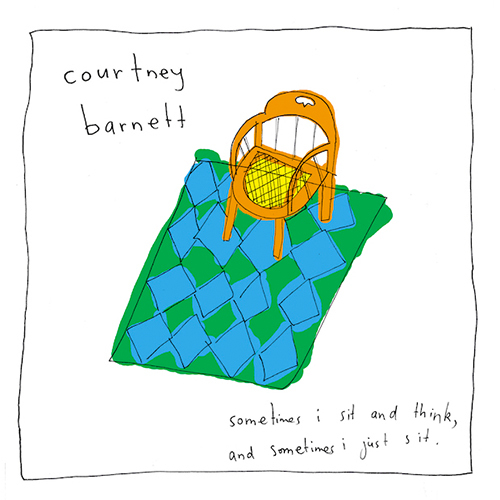 Barnett’s music is unabashedly relatable and off handedly hilarious. Sometimes I Sit and Think and Sometimes I Just Sit is worthy of comparisons to the elite class of indie rockers so here it goes: this album sounds like Pavement’s perennial masterpiece Crooked Rain, Crooked Rain with a little bit of The Hold Steady and Cake thrown in for flavor. It never takes itself too serious but it never feels too much like a joke either. Courtney Barnett has a firm handle on how to balance pop sensibilities with distortion pedals and she knows that melody makes it all come together. Sometimes I Sit and Think and Sometimes I Just Sit is not be the best or most important album of 2015, but it may end up as my favorite.